They might call them coasters, I’d rather call them phone stands. Perhaps phone seats. Smartphone slippers even?! Either way, if you’re looking for a fun gift for your staff, these might be just the thing. They’re created in the USA but you can get fairly cheap international shipping. They don’t cost much if you’re buying for an office, for promotional reasons or a group of friends maybe. They will laser-engrave your company logo onto the back and you can send it out to your business contacts – making a useful and memorable business card which will sit on desktops. Send them off this Christmas and, in addition to you getting some advertising, they’re going to get something actually useful. Made from clear acrylic, they have non-slip silicone feet and hold all sizes of phones. If you’re doing a trade show or presentation, you can also hand them out so that your brand and company get remembered by visitors. newPCgadgets introduces the latest version of their popular selling Smartphone Coasters for the upcoming holiday season. 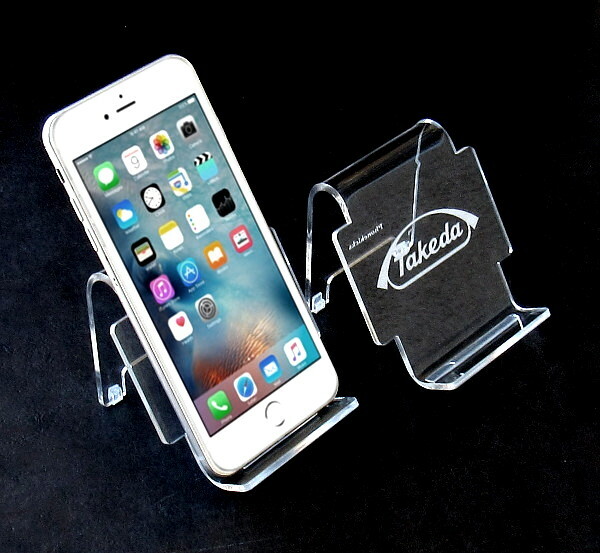 Smartphone Coasters combine the look of a business card with the convenience of a desktop phone stand to create a premium promotional item designed for all types of businesses. Smartphone Coasters are constructed of clear acrylic with non-slip silicone feet and a laser engraved surface. Smartphone Coasters hold all sizes of phones and most tablets. In addition, Smartphone Coasters can work as a charging base or convenience stand. As a seasonal holiday gift, Smartphone Coasters can be given to employees, clients and customers as an upscale promotional product designed to promote the corporate image while providing a beneficial phone stand. Smartphone Coasters are designed for real estate agents, hotel marketing directors and financial institutions to promote their brands. As a corporate swag item, Smartphone Coasters can be given out at trade-shows, corporate retreats, special events, non-profits and much more. Should you buy AirPods 2 to use with a Windows PC?